To compete with Nikon in getting bigger market share of the digital camera market, the world largest digital camera maker, Canon, has unveiled its latest digital single lens reflex (SLR) camera, EOS 40D, for advanced amateur users. 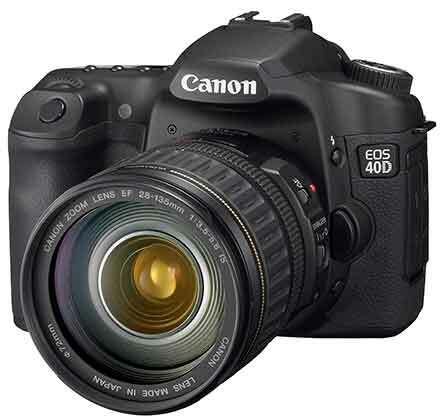 This new advanced camera model, EOS 40D, is the successor to the EOS 30D. It features 10.1 megapixel CMOS sensor; extensive noise reduction technology and 14-bit conversion for outstanding color tones and gradations. It is going for sale late August and it is estimated to sell for about $1,312. Read out more on Canon EOS 40D here. A survey was carried out by a research firm revealed that Nikon has successfully exceeded Canon in digital SLR camera sale since end of 2006. By introducing EOS 40D, Canon wishes to regain the market position especially in Japan. Besides EOS 40D, Canon also plans to launch seven new models of compact digital cameras and one professional-use digital SLR camera model by the end of the year.